The Secretary to the Government of the Federation, Mr. Boss Mustapha has said that the federal government is committed to attracting investors and investments into Nigeria and is providing appropriate legislation, infrastructure and security to protect them. Speaking in Lagos on Monday at the 59th Airport Council International, Africa conference with the theme: Business Transformation for Sustainable African Airports, Boss Mustapha stated that ‎ ‎the importance of aviation as a critical tool for social and economic development cannot be over emphasized, given its potential for immense contributions to the broader economy. According to him: him: “In 2017, the sector facilitated the movement of over 7.6 billion passengers, 109 million tons of cargo and recorded 89 million aircraft movements. With a highly mobile population of 180 million people, these explained the importance Nigeria attaches to the sector and the reason why Mr. President readily approved the hosting of the event”. The SGF observed that the Certification of two of the Nation’s key Airports namely; Murtala Muhammed international Airport Lagos and Nnamdi Azikiwe International Airport Abuja; Construction of five new international Terminals (Lagos, Abuja, Kano, Port Harcourt and Enugu) is to expand passenger handling capacity of the airports to 15 million passengers annually. ‎He noted that though these efforts have over the years significantly improved, the state of aviation infrastructure in the continent, African States nonetheless still need to upgrade facilities, improve operations, service quality, security and airspace safety. The SGF explained that in order to transform aviation business in Africa, countries would be expected to:” Continue to attain and maintain global safety standards; ‎Strive to achieve competitiveness and user friendliness; ‎ install infrastructure and navigational aids to maximize aircraft utilization for passenger and cargo movement; ‎ Achieve costs competitiveness, d‎evelop integrated multimodal transport system around the airports; and diversify revenue lines for sustainable development of African airports”. ‎He outlined what the federal government is doing to improve aviation in the country to include, implementation of Aviation Sector Roadmap which was approved by the President in 2016 aimed at opening opportunities for investment; ‎concession of four International Airports as well as the establishment of Search and Rescue Unit to be implemented through Public and Private Partnership; Establishment of the Presidential Enabling Business Environment Council (PEBEC) with the mandate to remove bureaucratic bottlenecks and constraints to doing business in Nigeria and Issuance of Executive Orders aimed at facilitating and easing entry experience of investors, visitors and travellers at the nation’s ports. He said the federal government goal is long-term business sustainability. 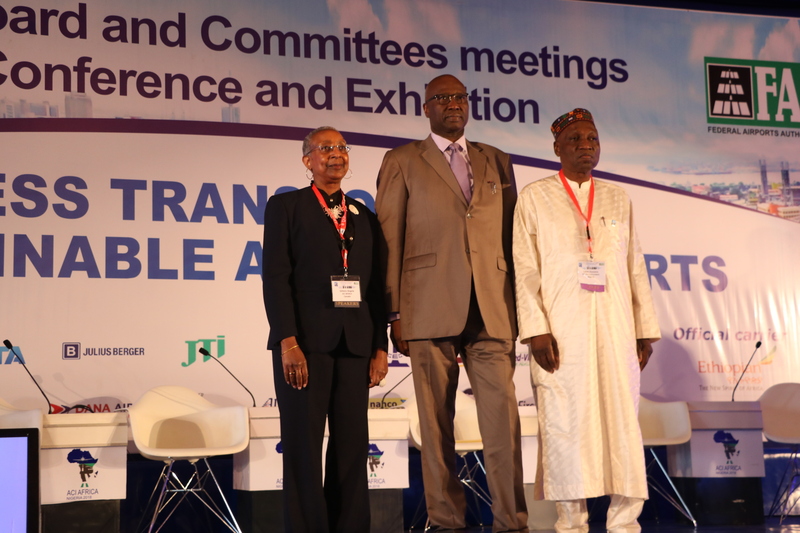 Dr Aliu stated that Airports serve as veritable gateways to this development and prosperity, facilitating the connectivity, tourism and trade which in turn foster economic growth and new opportunities all over Africa. He observed that connectivity is presently being enhanced with the launch of the Single African Air Transport Market (SAATM) in Addis Ababa, Ethiopia earlier this year, as well as through the African Continental Free Trade Area (AF CF TA) which was newly established by African Heads of State at their meeting in Kigali, Rwanda this past March. In his words:”The current efforts being undertaken to reposition air transport in Africa, and ensure its sustainability, are in clear acknowledgment of the fact that regional air traffic is still forecast to grow at roughly 3.8 per cent annually through 2032.
modernization of local aviation infrastructure, particularly at airports. This is a key reason why ICAO’s Global Plans are helping to establish globally harmonized objectives and requirements in support of the worldwide modernization of our sector which is now underway. Our related goal is to ensure there are no constraints of infrastructure capacity, technology and financial resources for aviation development”. “It has become increasingly difficult however, for many States and airport operators to mobilize the significant and dependable funding and investments required for high quality aviation infrastructure. The very limited volume of official development assistance (ODA) and South-South cooperation funding currently available for our sector’s infrastructure projects is a big part of this challenge, as are the constraints being faced with respect to public financing more generally. Another key concern is the risk associated with a lack of sufficient institutional, legal and regulatory enabling frameworks in many African States, something which makes it very difficult for financial institutions to invest in airport projects. We must also jointly recognize that the slow implementation of the Yamoussoukro Decision (YD) was for many years, a limiting factor on the number of flights many African airports managed and this made the financial situation quite precarious for many airports here, due to low utilization lot and therefore, poor returns on investment, increased focus on air transport liberalization, many African hub airports are now expected to exceed their capacity by 2020, with a new set of attendant challenges relating to the safety and efficiency of operations,” ICAO President emphasized. In his welcome address, the President of Airport Council International, Africa and managing director of the Federal Airports Authority of Nigeria, FAAN, Mr. Saleh Dunoma stated that last year, Nigeria signed the agreement to become one of the AC1 global training centers, to further advance the goal of human capacity development in FAAN and in Africa. He said the first training after the agreement was conducted in December 2017 where Nigeria received participants from other African countries. Dnoma explained that over the years, ACI Africa had focused on safety as a priority leading to the initiation of the world wide acknowledged Airport Excellence (APEX) in safety programme. This has recorded great achievements as major airports continue to requests for this programme. certification of our 2 busiest airports. bold step to carry out the APEX in safety programmes in our international airports. were carried out in March while reviews for Enugu and Kaduna airports are scheduled for June this year”. Dunoma said the evolving nature of airport management demands a transformation of airports who now mostly serve as public service providers and not commercial enterprises that are efficiently managed to generate more revenues and subsequently declare profits.